What’s the fun part of going to Red Lobster? How do you get the gravy mopped off of your plate in a satisfying yet dignified manner? What’s better than toast as a carrier for fruity jam? The answer to all of these important questions comes in the form of the fluffy, moist, and positively addictive biscuit. 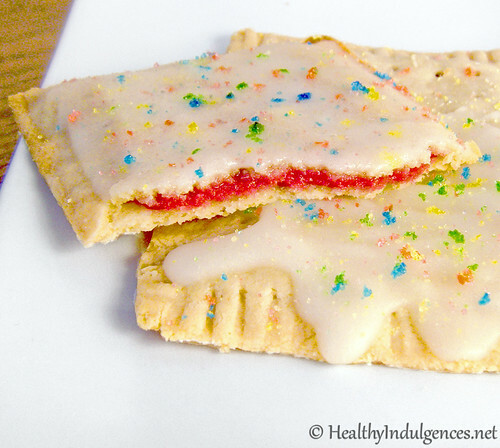 I always associate them with memories of volleyball tournament weekends and team breakfasts at Cracker Barrel. Soft white biscuits with a pat of butter and a drizzle of honey were a meal all by themselves for my former carboholic self. 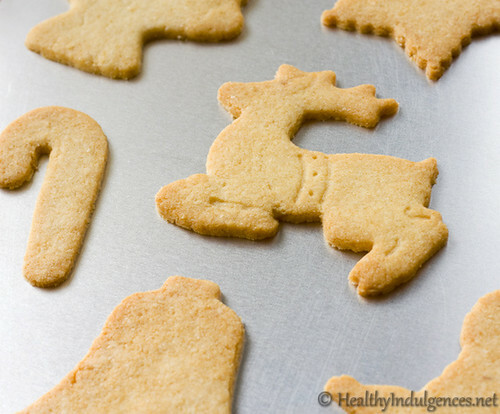 Baking powder biscuits are made with a pretty standard technique and recipe, consisting of all purpose flour, baking powder, and some sort of fat cut into the flour. It’s not that simple, though. You have to handle the dough tenderly, working it just to the point where it comes together without aiding gluten formation, which acts to toughen it. You have to consider the protein content of the flour you’re using along with the way you cut out the biscuits (press, not twist!) so as to ensure flakiness. 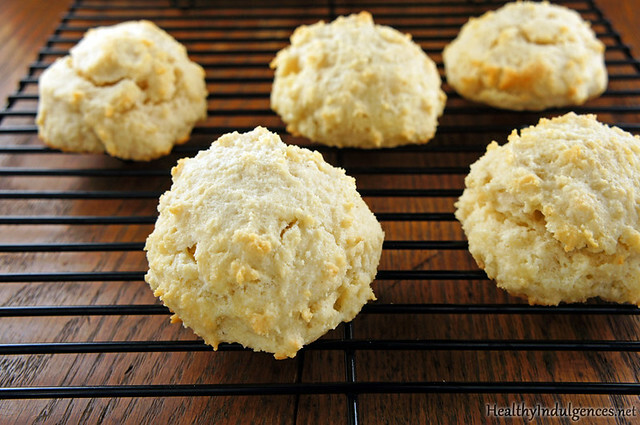 Shockingly, it’s much easier to make gluten-free nutrient dense biscuits. For once, we health nuts have an easier time of making a baked good! Let’s celebrate with some good eats, shall we? You may be wondering at this point how such a feat is possible. Biscuits with no flour and no fancy shmancy natural ingredients to imitate gluten? How can this be? It’s all in the egg whites, my friend. They are the solution to all of your problems. They fluff, they puff, they create airy little clouds with just a little coaxing and some hot steamy lovin’ from the oven. Egg whites are all protein, zero carbs, 20 calories a pop. Fortunately, egg whites happen to play nicely with almonds, another hero of the low carb bakingverse. Finely ground blanched almonds have very little nutty taste and yield a light, moist texture to these easy peasy biscuits. Finally, we introduce the fat to the party in the form of butter or shortening. Not just ANY shortening mind you! Trans-fat free shortening made from organic palm oil will fluff up your pastries without shortening (hah!) your lifespan. It has a higher melting point than butter, allowing the protein structure of the egg whites to puff up more around the fat before it melts away. Butter for flavor, shortening for texture is the rule. That rule doesn’t totally apply here since almonds already have a nice flavoring and fat component, unlike the processed “enriched” garbage that is white flour. When I was testing batches, I noticed that butter allowed for more browning on the tops. 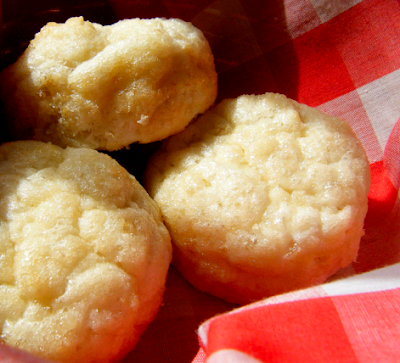 The flavor was comparable when the biscuits made from both fats were tasted side by side. If you want a better rise, it’s worth the special trip to your local health food store to find Spectrum Organic Palm Oil Shortening. That’s the only kind I’ve ever seen around here. It’s priced comparably to organic butter, so you have no excuse for not trying it out! 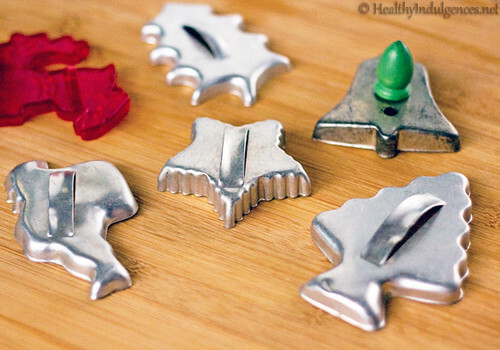 These little guys were baked in foil-lined ramekins. They came out the perfect size and shape! The technique for these biscuits is simple. All you need is a fork and couple of bowls. Follow these simple steps to biscuit perfection! 1. Cut cold fat (butter or shortening) into dry ingredients with the tines of your fork, rotating the bowl around with your other hand until the mixture has pea-sized chunks throughout. You could also use a pastry blender, in which case you probably don’t need to read these instructions. 2. Optional: Chill mixture in the fridge for 5-10 minutes or as long as you can stand it. The longer the better. 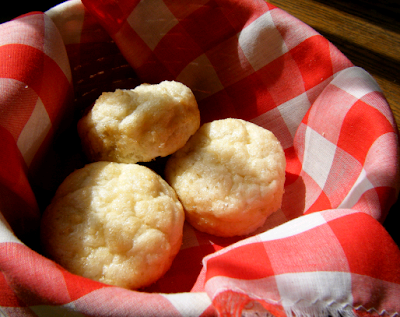 The more the fat can get cold and hard, the puffier your biscuits will be. Remember that! 3. Separate the egg yolks from the whites (using the shell halves to tip the yolk back and forth a few times). Reserve yolks (save all that creamy goodness for ice cream or homemade mayo!) and whisk egg whites with a fork in a bowl for 20 seconds, until no longer stringy and gloopy. You just want ’em a little foamy. 4. Remove mixture from fridge and whisk in the egg whites for a couple of seconds, breaking up any massive chunks in the dough with your whisk or fork. It’ll be an extremely runny dough with chunks of the almond mixture. 5. Drop biscuits in 4 mounds on to a cookie sheet. For puffier biscuits, pour batter into greased foil-lined ramekins/nonstick muffin cups/a muffin top pan and get that sucker in the hot oven before the fat can even THINK about softening! The plain version is just lovely all by itself, hot out of the oven or toasted with homemade strawberry preserves. A teeny drizzle of honey whipped into butter would be a heavenly spread. I had to eat a few fresh biscuits to make sure they were as good as my tastebuds were telling me. You, too, might feel compelled to eat more than one, so beware! See numbered steps listed above! IF YOU ARE USING FOIL-LINED RAMEKINS, bake for 15 minutes. IF YOU ARE USING A MUFFIN TOP PAN, bake for 12 minutes. The edges of these biscuits stick really badly, so be sure to grease liberally whatever vessel you’re using to bake these. Some sort of non-stick pan works best here! Silicone muffin cups are great, too. Greased foil-lined ramekins are alright, but you have to gently tease the muffins out of the foil. Try some of these variations just for fun. These little guys are versatile, so play around with them and share your flavor combos with me, please! 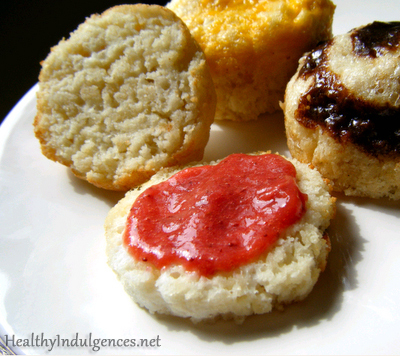 A plain biscuit with homemade sugar-free strawberry jam, a cheddar garlic biscuit, and a sweet cinnamon biscuit hangin’ out. Add most of the cheese and all of the garlic powder to dry ingredients. Cut in shortening and chill dough. Whisk in egg whites and fill ramekins. Top with a bit of the reserved cheese. Bake as directed. Add most of the cheese and all of the herbs to dry ingredients. Cut in shortening and chill dough. Whisk in egg whites and fill ramekins. Top with a bit of the reserved cheese. Bake as directed. Add vanilla and sweeteners to dry ingredients. Cut in shortening and chill dough. 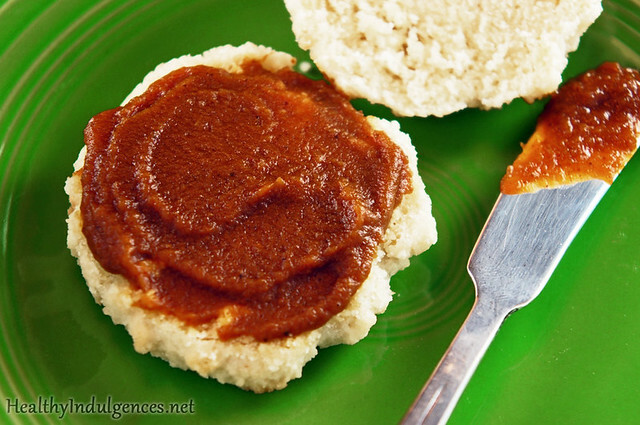 Melt butter and molasses together in a microwave safe dish for 15-20 seconds, until butter is melted. Stir in stevia, erythritol, water, xanthan gum, and sea salt. Heat mixture in microwave for another 15 seconds or so until erythritol is dissolved. Pop the filling into the fridge and let it cool until it thickens a bit. Whisk egg whites into flour mixture and fill ramekins. Dollop cinnamon filling on top of the dough in a swirl and bake as directed.